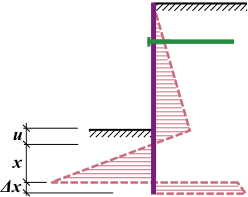 Anchored wall fixed in heel is analyzed as a continuous beam using the deformation variant of the finite element method in order to comply with the assumption of heel fixed in the soil. The actual analysis is preceded by the determination of load due to earth pressure applied to the structure. The pressure acting on the back of a structure is assumed to be the active pressure, while the front face is loaded by the passive pressure.